what you'll see on the roads again soon. I mentioned a while back (here, if you're interested) that I'd not been on the bike for a while because I was picking up my son from school and walking him home. Walking the bike and a rather impulsive child along busy streets was a bit too difficult sometimes and I put him before the bike. 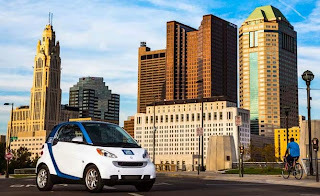 I've still been busing and, more recently, car2go-ing as needed, to get to and from the office and around town. And frankly, my poor bike has been sitting in the garage, not being ridden much at all. My office is a little over 4 miles away from home, not a big deal to ride at all. It's actually less distance than it was when I stopped back in 2012 by about a mile. And now that my son is going to another school building - where my wife is picking him up on the way home, now - there's no reason for me not to pick up where I left off way back when. I still have my bike, my panniers, my yellow fluorescent jacket, and I just ordered some new Action Wipes for post-ride clean-up. I probably need a new helmet and I need to see what shape my riding glasses are in, but really that's all I need. Well, maybe some new fenders, too. I also talked to our HR rep here at work about getting a card for the parking garage here, where cyclists have a safe place to keep their rides. Indoors, behind locked doors and away from the bad weather... what's not to love? I'm looking forward to this. I haven't had a lot of low-level aerobic activity in a while - the stuff I've been doing has either been high-intensity interval training (HIIT) or nothing, and that's obviously not a good thing. You need a bit of both for maximum health and fitting a bit of it into my normal daily routine is going to be just the thing. I could go on about the benefits, but there's a whole website here that's been talking about the benefits for years and there's no change in those at all. But what is worth mentioning is how things have changed in Columbus since I last rode off. The bike infrastructure here in town has been vastly expanded, with varying levels of success (in my own estimation, naturally). 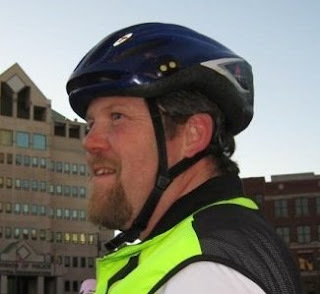 As you know if you're one of my old readers, I tend to be of the vehicular cycling crowd - take the lane, be assertive, know your rights and responsibilities as a bike commuter, etc. The law hasn't changed much at all since I started riding way back in the Flintstones era, and with more people cycling now people are MORE aware of cyclists than they ever have been. The route I'll be taking is going to be going down Summit/3rd Street on the way to work, and 4th Street on the way home. 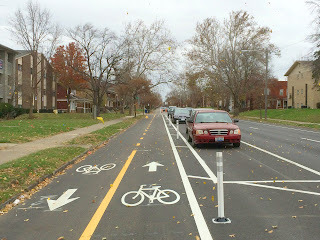 If you've been following Columbus bike work the past few years, you'll know that those routes have separated bike lanes on them now, and from what I'm seeing they're pretty well traveled. While I took my bike classes with the expectation that I wouldn't need infrastructure changes like this, I can't say that I don't welcome the opportunity to try them out. I am fully prepared to be convinced that they're working well and to throw away my dislike of bike lanes and sharrows and the like, if they are doing the job (well, maybe not sharrows... hee hee!). I'll be sure to let you know how I think everything is going and keep on posting in here. Give me a wave if you see me out there! Congrats on the return! I hope to start my season this week as Spring has finally broken in northern Michigan. Thanks Dan - I'm pretty excited to get going again. Of course, my bike is in the shop getting tuned up after a few years of sporadic-at-best riding, so I can't do anything for the time being other than pull together panniers, locks, helmets, bike jacket, etc. I grew up in Michigan - Alma, to be exact. Where are you? I've been in Traverse City for 4 years, and I really like the area. No infrastructure on the scale you describe in Columbus, but we do enjoy some trails and lanes. A protected lane is being installed this year on a major east-west street that will help encourage cycling. Sounds great. That's a beautiful area up there, I bet the trail situation is really good. Probably not a HUGE help with commuting, but recreation can be just as important!